Riviere Saint Pierre, Meadowbrook Golf Course, Cote St Luc. 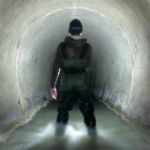 In a golf course to the west of downtown Montreal, you’ll find the last remaining portion of Rivière Saint-Pierre that still exists above ground. 200 meters are all that are left of a river system that once flowed freely over the landscape. 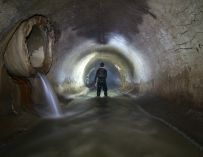 The rest of it’s been retrofitted into the city’s sewer system or lost entirely. This one brief open stretch is found at the river’s upper reaches, in the town of Montreal Ouest. If one were to follow the river’s original path downstream from here, fifteen kilometers later you’d find yourself standing at the tip of Pointe à Callière. It was here, where the river spilled out into the open waters of the St. Lawrence that the city of Montreal first began. 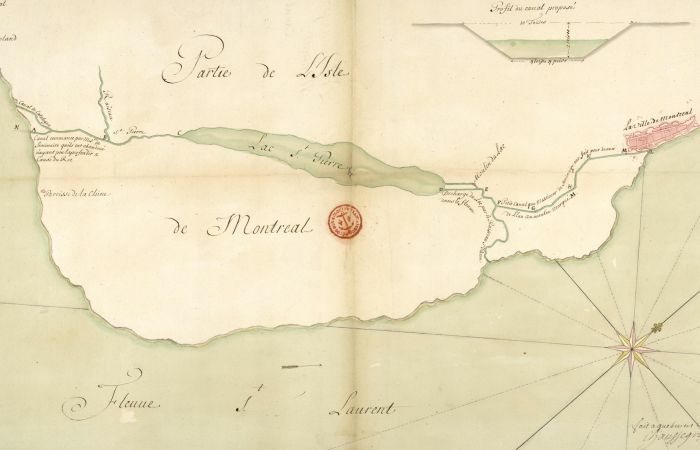 Rivière (and Lac) St-Pierre shown with proposed alterations, 1739. Much has already been written about the origins of Montreal so I won’t waste space explaining it in detail here. Here is the Coles Notes version: while native Indians had already made use of the land surrounding the mouth of Rivière St. Pierre for centuries, Samuel de Champlain was the first French explorer to take notice of the area’s potential for a permanent development. In 1611, he made note of the land and came to the conclusion that its conditions were favourable for establishing a fur trade outpost. By the year 1642 the village of Montreal was officially founded. 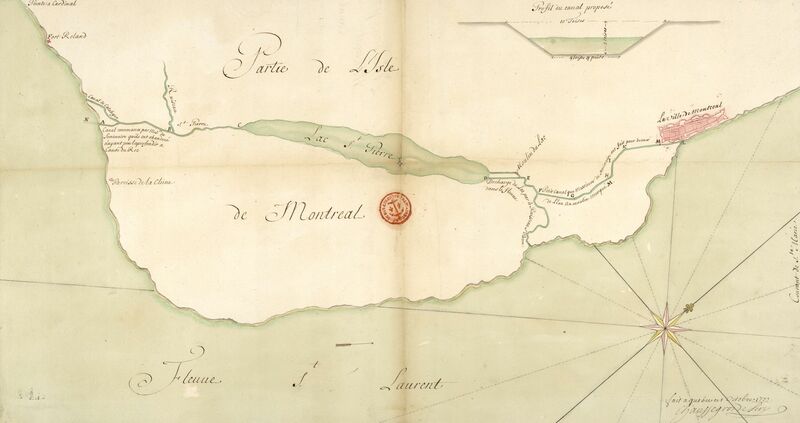 At the mouth of Riviere St. Pierre during the early stages of Montreal in 1700. Over the course of Montreal’s evolution, Rivière Saint-Pierre (or the Petite Rivière Saint-Pierre) has slowly been altered and effectively removed by man. By the early 1700s, attempts were already being made to rework the river, the goal being to create a passage to bypass the unnavigable waters of the Lachine rapids. Its plump middle stretch (often referred to as Lac Aux Loutres), would soon diminish in size, perhaps as a result of the Saint-Gabriel canal project which attempted to draw water from the lake to supply the town mill. 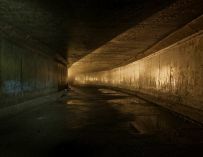 The first phase of covering the river occurred in 1832 with the creation of the William Collector; a vaulted stone conduit that covered the initial 350 meters. The river had long been used as a convenient dumping ground for both human waste and anything else that needed to be disposed of. As a result its waters grew increasingly foul to the point where it eventually started to become an issue for public health. Covering this portion of the river was to be the beginning of an “of sight, out of mind” policy towards waste disposal that still exists today. From there, the river’s westward portions would gradually suffer a similar fate, but not before further straightening, dredging or repositioning depending on what stood in its way. Following its course on maps is often confusing as its position changes frequently, often vanishing on one map, only to reappear later on another. Even more frustrating are the older maps, which are less than precise and display a certain amount of creative license (or guesswork) on behalf of their cartographers. As the city became more industrialized during the mid to late 1800s, the river began to serve several functions. The city’s waterworks company created a tailrace for its wheelhouse using a portion of the river in Verdun, while further north, leather tanneries made use of its flow to help drive steam engines. More often than not, though, the river was quickly becoming integrated with the large-scale sewer system that was starting to be developed. 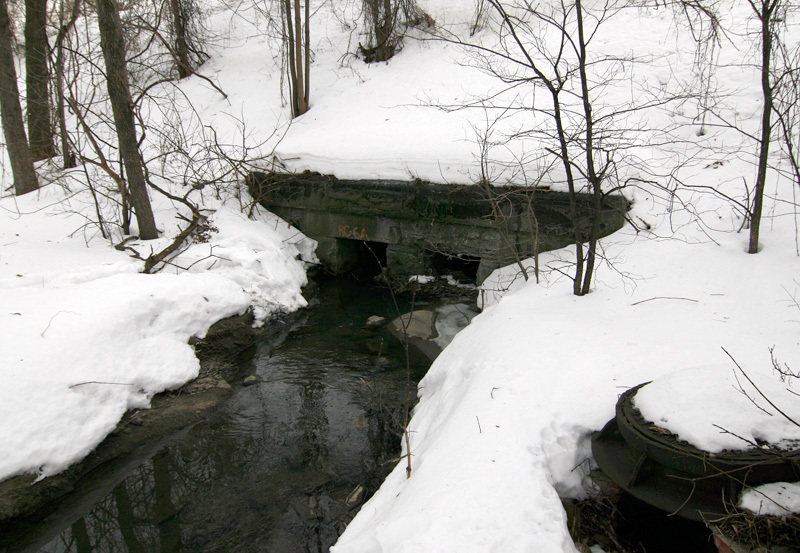 By the mid 1930s roughly a third of the river had now disappeared to the sewers system, much of that lost with the construction of the St-Pierre collectors. 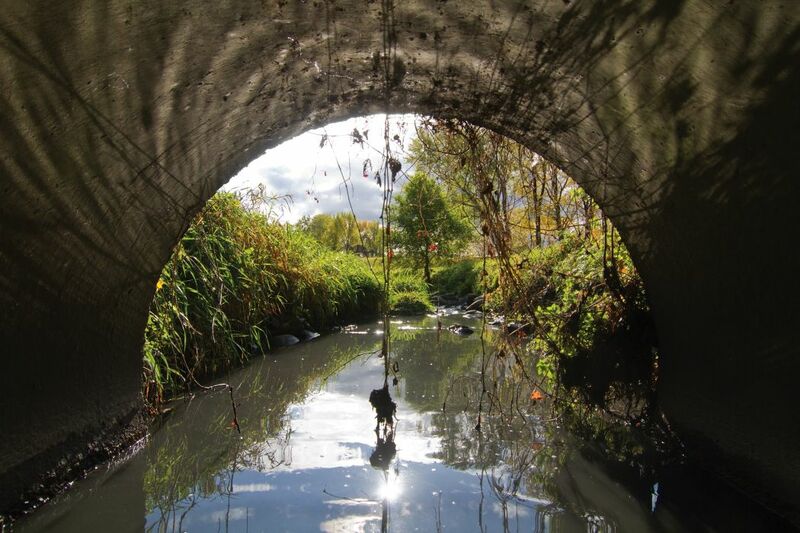 Today, these two 15’ and 17’ concrete conduits collect the majority of wastewater from Westmount to outlying communities as far west as Cote St Luc. 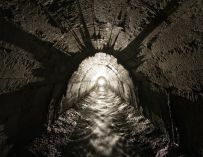 The two sewers bring the flow towards a point in Verdun. 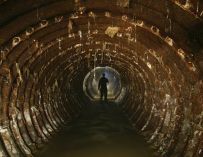 From there everything is funneled down into the southeastern interceptor where it begins its long journey towards the island’s wastewater treatment plant at the East end of the island. Out of sight, out of mind. Presently, only the 200 meters of river mentioned in the beginning of this entry remain visible. It makes a brief appearance in Montreal Ouest within the grounds of the Meadowbrook Golf Club. The water of the river (really more of a rivulet at this point) first sees daylight at the end of a four foot concrete pipe and by the time it reaches the edge of a Canadian Pacific Railway yard, it heads underground again. It was CPR that first owned this land and who later used it to establish a recreation club for its employees. It’s safe to assume that this one particular section of Rivière Saint-Pierre was spared only for the natural charm it helped give the golf course. 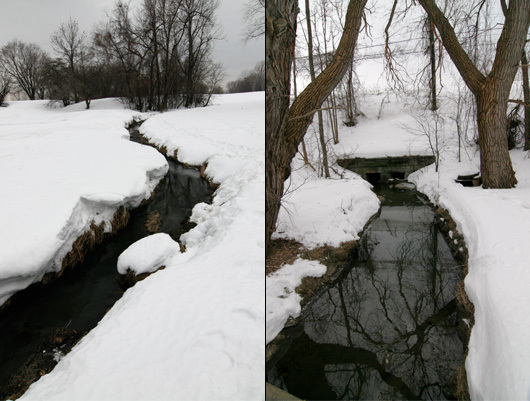 Besides, what would Meadowbrook be without a brook? A bit west of this, on the same property, a trickle of water is all that remains of a former tributary. It barely registers as anything today, but the shape of its outer banks suggests a time when there was once something more substantial flowing through here. The Meadowbrook Golf Club has been in the news recently. The present owner of the land wishes to sell a portion of it to developers who are eager to put up subdivisions. Not surprisingly, this has been fought tooth and nail on behalf of locals who see the golf course as a vital piece of green space for their neighbourhood. Three and a half centuries after Champlain first ordered the land surrounding the mouth of Rivière Saint-Pierre be “cleared off” and to be made “ready for building,” we arrive at the upstream end of this same river to find (not surprisingly), similar demands are still being made today. The twin limestone channels through which the river makes its entrance into the sewer system. So it’s from this point where we’ll follow the river underground; through the limestone infall found below the railway tracks. It doesn’t look like much, but it soon gets interesting once inside. Excellent first entry, I look forward to more quality reading in the future. So professional and interesting to boot. Fantastic! Cheered up my Monday morning. A thoroughly interesting read. Nice! Just linked from worksongs and this site is great! Je suis souvent passé en train à côté du club de golf, et ait souvent remarqué ce ruisseau. Awesome… I coicidentally wrote about vanishing rivers yesterday before finding your site on Spacing Montreal. I am going to link my blog to this story sometime this week as a follow-up to my short “Topography” blog. I lived on Regent Avenue in NDG. 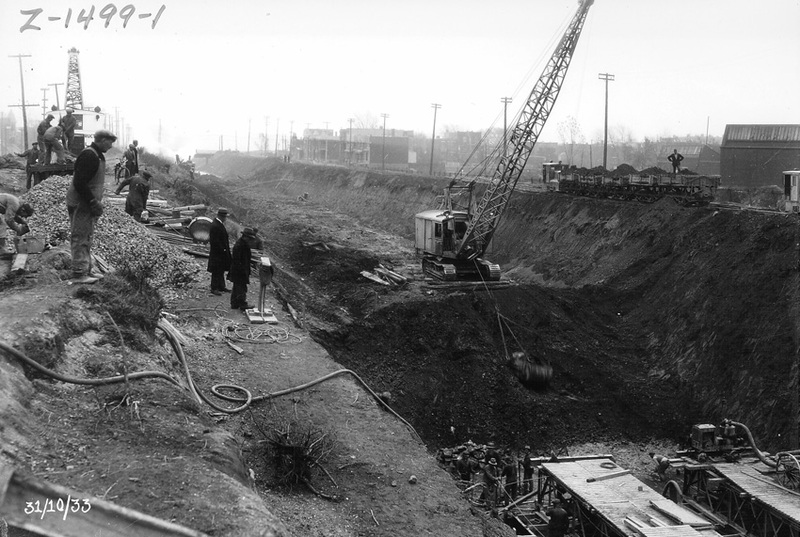 In the mid 1950′s we would go swimming in a creek between the train tracks and the bottom of the embankment. Great read – well assembled! I grew up next to Meadowbrook, and 30+ years ago, as a young boy, that little river was a favorite spot for quiet contemplation, and it was clean enough (to see, not to drink!) back then to satisfy our boyish curiosity…looking for frogs, snakes and the like. On Westluke Ave., in line with the river’s path, there is a shack which I believe is housing a floodgate or control valve for the river, as a “young explorer” I recall going inside, and there was a deep shaft where water could be heard below. 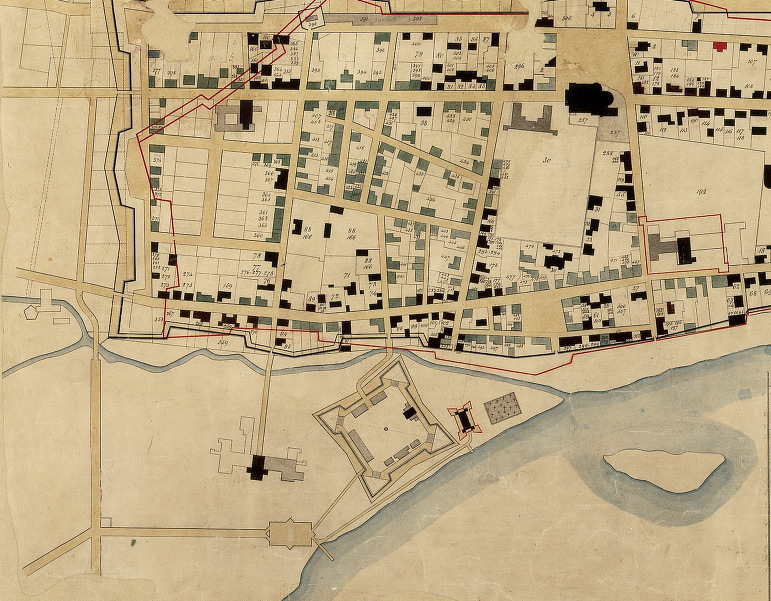 During a summer job with the City of Cote-St-Luc many years ago, I was hired to archive all the old city documents onto microfilm – and I was amazed to see all the old maps & city planning documents from the early 1900′s – and learning about this actual river running such a long course under our city. i live on michel bouvier,near st leonard,,i find it so strange,,people here,dont know nothing about rivers,they look at you like your nuts,,& by the way,all the houses around here have foundation problems,is becaues,of rivers bellow. …….you’ve just scratched the tip of the iceberg my friend,……..there’s so much more !!! Tu me permettras une petite correction ici sur l’histoire de la rivière Saint-Pierre. Son embouchure originale n’était pas à la pointe à Callière comme tu le mentionnes dans le premier paragraphe, mais bien à Verdun devant l’île des Soeurs, comme le montre bien les cartes anciennes, et celles que tu mets ici. La rivière embouchant à la pointe à Callière est ce que les textes et cartes historiques nomment la Petite Rivière, qui est en fait la rivière Saint-Martin qui arrove de l’est au nord du Vieux Montréal et qui ramasse les affluents divers tels que, d’ouest en est, les ruisseaux Glen, Prudhomme, Burnside, de la Côte à Baron… C’est lorsque les Sulpiciens décident de faire le lien entre la rivière Saint-Pierre (vidant ainsi le lac à la Loutre) et la Petite Rivière que le tronçon aujourd’hui sous la place d’Youville et canalisé par le collecteur William portera le nom de Petite rivière Saint-Pierre. Cette modification importante a changé en grande partie le déversement de la rivière Saint-Pierre vers le Vieux-Montréa au détriment de son embouchure originale devant l’île des Soeurs. 1) Raoul Bonin, article publié en 1936 dans le Bulletin des Recherches Historiques, p.265. Propriétés en valeur du Séminaire de Montréal / [Antoine Molin, p.s.s.] – 1808. P1:7A-1 – Notes historiques de Pierre Rousseau, p.s.s., sur le canal et les moulins de Lachine. – 1680-1733. I remember this river. As a kid back in the early 50 and early 60′s we would go looking for tadpoles but as Cote-St-Luc extended out in a more Easterly direction, this lake slowly started to become extinct.